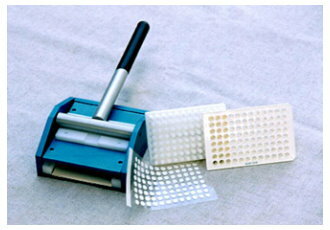 Remove Filter Membranes from 96 Well Microplates in Seconds (works with Millipore Plates only). Eliminates unproductive manual membrane removal. The filter-removal device allows quick simultaneous removal of all filter membranes from 96-well filter-bottom microplates, which are widely used for elispot assays, protein arrays and cell cultures. Due to its robust design and compact size this device can be used as a tool by forensic scientists and law-enforcement officers to collect samples from crime scenes. It can be also used by military and environment protection agency specialists who need to collect and process hundreds of samples in a short period of time. Includes compressing device, 96-pin plastic pusher and a rubber pad.